The Lassco Wizer floor standing three spindle drill comes in two different models, the FMMP-3 and the FMMSP-3. Both of these machines are 3-spindle pneumatic paper drills that offer a 2 inch drilling capacity, with one major difference of a foot petal activated pneumatic powered table! The FMMS-3 Standing Drill offers a 2″ drilling capacity with stationary heads that are set for drilling three holes 4-1/4″ on center to center for standard three ring loose-leaf binders. The rugged mechanical lift table smoothly traverses right and left 14 inches for multi-hole drilling. The manually activated foot petal control allows for hands to be free. The manual control is a great way to save money while maintaining control of the drilling process using two hands. This machine is built for ease in operation and maximum production performance. The FMMSP-3 offers all the features that the FMMS-3 offers with the added convenience of a foot petal activated pneumatic powered table with stationary heads. The mechanical lift table traverses right and left for multi-hole drilling. The FMMSP-3 comes with a 5/16” standard hollow drill and features stationary heads set for drilling three holes, 4-1/4 inch on center. Both of these machines include an accessory package with a drill sharpener, Spin-Eze drill bit lubricant, 5/16” drill bits, and chip clearer. If you have any questions or are interested in the FMMS-3 Spindle Fixed Paper Drill or the FMMSP-3 Spindle Fixed Paper Drill, visit us at SpiralBinding.com. 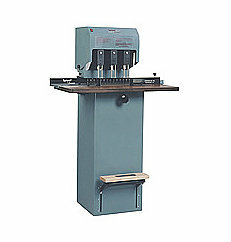 We have great pricing on a full line of Floor Standing Drills. Call us at 1-800-631-3572 for more information!